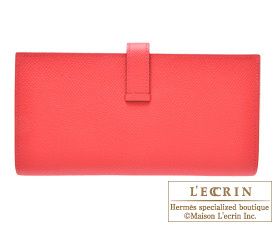 Hermes’s latest signature long wallet, the simple and elegant Bearn Soufflet. With a width allowance of 1cm, Bearn Soufflet wallets can fit about 100 pieces of notes, 5 credit card slots, 4 flat pockets and a wide opening for the zipped change purse for coins. Announced in 2010 Spring Summer collection 「Bougainville」is named from the flower that is named after French explorer, Louis Antoine de Bougainville. Blooming brilliantly under the tropic sun, the passionate red reflects the color of the vibrant bougainvillea. This color is similar to Rouge Garance. 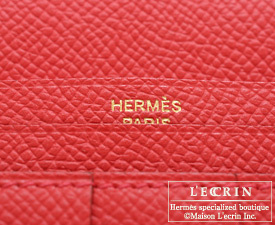 Epsom leather is a very popular embossed leather with a beautiful rigid and structured shape. This compressed type of leather holds true to its shape in all instances and is completely resilient to scratches and dirt even when used daily. 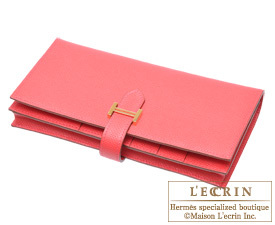 Up your class and status with an Hermes wallet collection. 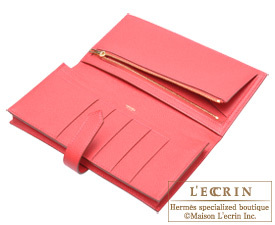 Crafted using the best of leather, it's an investment that will be your favourite!